Editor’s Note: The U.S. Transhumanist Party is pleased to publish this in-depth interview by Yuri Deigin of Dr. Aubrey de Grey, the U.S. Transhumanist Party’s Anti-Aging Advisor. Herein Dr. de Grey offers original, in-depth insights regarding the current state of research and public opinion regarding the pursuit of advances in rejuvenation biotechnology that will hopefully achieve significant life extension, one of the U.S. Transhumanist Party’s Core Ideals, within our lifetimes. This interview was originally published in the Russian language here. The English-language version was first published by one of the U.S. Transhumanist Party’s Allied Organizations, the Life Extension Advocacy Foundation (LEAF), here. 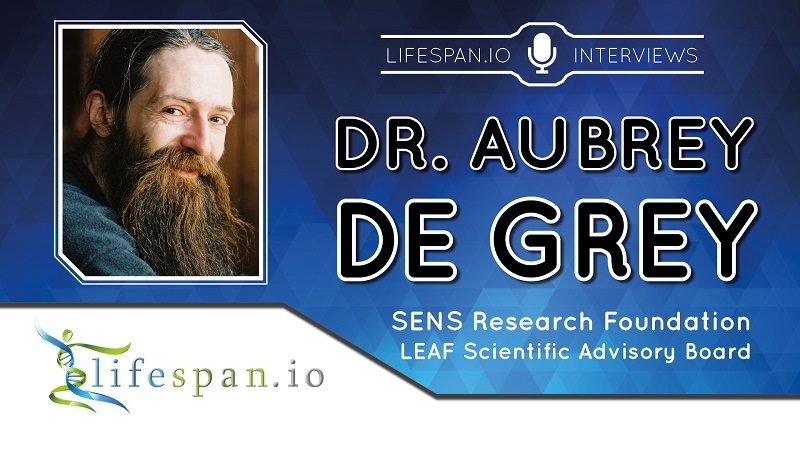 Note from the Life Extension Advocacy Foundation (LEAF): Today we have an interview with Dr. Aubrey de Grey from the SENS Research Foundation. This interview conducted by Yuri Deigin, CEO at Youthereum Genetics, was originally published in Russian language and he has kindly translated it into English so our audience can enjoy it, too. Yuri: Aubrey, thank you very much for agreeing to this interview. Why don’t we dive right in? I am sure everybody asks you this: how and when did you become interested in aging, and when did you decide to make it your life’s mission to defeat it? Aubrey de Grey: I became interested in aging and decided to work on it in my late 20s, so, in the early 1990s. The reason I became interested was because that was when I discovered that other biologists were almost all not interested in it. They did not think that aging was a particularly important or interesting question. I had always assumed, throughout my whole life, that aging was obviously the world’s most important problem. I thought that people who understood biology would be working on it really hard. Then, I discovered that wasn’t true and that hardly any biologists were working on it. The ones that were weren’t doing it very well, not very productively as far as I could see. I thought I’d better have a go myself, so I switched fields from my previous research area, which was artificial intelligence. Yuri: By the way, do you think there are disproportionately many people from computer science in aging research these days? Aubrey de Grey: There are a lot, and there are lots of people who are supporting it. Most of our supporters are, in one way or another, people from computer science or from mathematics, engineering, or physics. I think the reason why that has happened is actually very similar to the reason why I was able to make an important contribution to this field. I think that people with that kind of background, that kind of training, find it much easier to understand how we should be thinking about aging: as an engineering problem. First of all, we must recognize that it is a problem, and then we must recognize that it is a problem that we could solve with technology. This is something that most people find very alien, very difficult to understand, but engineers seem to get it more easily. Yuri: So do you think that people who don’t have such a background, this way of thinking, have a chance of understanding the importance of this problem, or are they better off letting people with an engineering mindset figure it out? Aubrey de Grey: Well, of course, there is always an overlap. The reason I spend so much time doing interviews and running around the world giving talks is precisely in order to help people, for whom this is not obvious, to think about these things. For any new idea or any new way of thinking, there are always people who understand it first and who then communicate that knowledge to other people. Yuri: Right. And you have been running around giving talks for a very long time, as I understand. It’s been, what, twenty years? Aubrey de Grey: Well, at least 15 years that I’ve been doing a lot of it. Yuri: So between the time in your twenties, when you realized that aging is not something that’s being adequately covered by biologists, and the time when you decided to have a go at it yourself, how many years have passed? And can you give a bit more background on when you founded SENS and what SENS is? Aubrey de Grey: Sure! The year in which I switched fields properly is probably 1995. For the next five years, I was basically just learning. I was going to all the conferences, getting to know the right people, leaders in the field. Learning a lot of what was known and doing a huge amount of reading, of course. The big breakthrough came in the summer of 2000 when I realized that comprehensive damage repair was a much more promising option then what people had been doing before. Since then, it has been a matter of persuading people of that. There were a few years when I was just ignored and people thought I was crazy and didn’t think I made any sense. Then, gradually, people realized that what I was saying was not necessarily crazy. Some people found it threatening, so in the mid-2000s, I had a fair amount of battles to fight within academia. That’s normal; that’s what happens with any radical new idea that is actually right, so that happened for a while. This decade, it’s been rather easier. We founded the SENS Foundation; we’ve started getting enough donations into the SENS Foundation to be able to do our own research, both within our own facilities as well as funding research at universities and institutes. Gradually, this research had moved far along enough that we could publish initial results. Over the past two or three years, we’ve been able to spin off a bunch of companies that we have transferred technology to so that they can actually attract money from investors. There are, of course, an awful lot of people out there who believe in what we are doing, but they fundamentally don’t like charities; they don’t like to give money away. They have been waiting for the point when these projects move far enough ahead that they are investable, and that’s resulting in much more money flowing into these areas. Yuri: This is a good point you bring up – that a lot of wealthy people for some reason aren’t prepared to spend money on fundamental research on aging but somehow desire a financial return on their investments in this field. Do you know why that is? Why can’t they realize that in their position, it is much more rational to try to convert their wealth into something much more valuable that they cannot yet ever get back, which is years of healthy life. Why do they try to also make money on this research? Aubrey de Grey: Well, it’s not really a rational decision, and it’s different for every individual, whether it’s for that reason or any other. Let me first say that it actually seems less of a problem in Russia. Our single biggest donor at the moment is Vitalik Buterin, the guy who created Ethereum, who is a Canadian of Russian heritage. Another major donor of ours is a guy named Michael Antonov, one of the co-founders of Oculus. I think maybe Russians have less of a problem with this. However, in general, the kind of people who have a lot of money and who are also visionary enough and understand technology enough, they tend to be the kind of people who made their money by doing certain things; they got it through the capitalist system. So, those kinds of people are inherently biased in favor of that system and against philanthropy. Then, of course, there are many other reasons. There are some people who won’t give us money because they don’t think it’s a good idea to defeat aging. There are plenty of people who want to give us money, but their wives think it’s crazy. I am not kidding! There are at least a couple of our major verbal supporters who I know for a fact that that’s why they are not giving us significant amounts of money. Another reason, I think, is that some people just have overly big egos, so they think they can do better than us even when they can’t. Yuri: Let me probe you a little bit more on this. You brought up wealthy Russians and people who think they can have a go at aging themselves. Would Sergey Brin qualify as one of those people who decided they know better and founded their own company, Calico, for precisely this reason? Aubrey de Grey: Yeah, I had a funny feeling you might ask me about that. I have a very low opinion of Calico. The fundamental reason for this is because of Larry and Sergey. In fairness to Sergey, my understanding is that Calico is mainly a Larry project, or at least more so than a Sergey project. Of course, they are both on the Board of Directors, and they both share the responsibility. At the end of the day, Calico is a catastrophe, and it’s their fault. They just created it wrongly. They’ve known me for fifteen years; they could easily have told me, “Listen. We don’t like charity. We want to create a company, and we want you to run it,” and I would’ve said “No problem!” and they knew that. Instead, they decided to be more traditional about this. I don’t know why. Maybe they don’t like people who have beards. The fact is that they made an absolute catastrophe of it. They started out reasonably sensibly by hiring Art Levinson, the world’s best biotech CEO, but what they didn’t do was tell him what to do next. They gave him a job to cure aging, and he doesn’t have the slightest idea how to cure aging, and he knows that he doesn’t have the slightest idea. So, he hired someone who he thought would have an idea how to do it and made him Chief Science Officer. Unfortunately, he didn’t know how to make that decision either, so he hired completely the wrong person. He hired a completely inveterate basic scientist, David Botstein, who is a fantastic scientist but who doesn’t understand technology. In fact, he went on record saying that he doesn’t have a translational bone in his body. You don’t get that sort of person to run an outfit that’s supposed to be solving a technological problem. Sure enough, they are doing fantastic research that will understand aging better and better as time goes on over the next century, but they will never, ever, if they follow their current strategy, actually make any kind of difference in how long people can stay healthy and, therefore, how long they can stay alive. Yuri: Why do so few people have a sense of urgency that we need to do everything possible to combat aging within our lifetimes and not centuries to follow? Aubrey de Grey: There are two answers to that. The David Botstein answer, the Calico answer, is that they just don’t understand the idea of knowing enough. People who work on basic science understand how to find things out, but that’s all they understand. For them, the best questions to work on are the questions whose answers will simply create new questions. Their purpose in life is to create new questions rather than to use the answers for a humanitarian benefit. They don’t object to humanitarian benefit, but they regard it as not their problem. You can’t change that. Botstein is a fantastic scientist, but he’s in the wrong job. The other part of your question, why people, in general, do not regard aging with a sense of urgency, has a different answer. People weigh up the desirability and the feasibility. Remember that everyone has been brought up to believe that aging is inevitable, I mean completely inevitable in the sense that stopping it would be like creating perpetual motion. If the probability of doing something about this thing is zero, then the desirability doesn’t matter anymore. So, under that assumption, we really ought to put it out of our minds and get on with our miserably short lives. That’s all we can do. Yuri: So it’s a case of learned helplessness? Aubrey de Grey: Yes, exactly, it is learned helplessness, and it’s a perfectly reasonable, rational thing to be thinking until a plan comes along that can actually solve the problem: a plan that demonstrates that we actually might be within striking distance of genuinely solving the problem. That only happened quite recently. Of course, I have a huge mountain to climb to persuade people that we have crossed the boundary from this being just a recreational, exploratory field to it being a technological, translational field. Yuri: Have you had success in the past fifteen years that you’ve been climbing this mountain; have you seen that the public’s perception has greatly improved? Aubrey de Grey: Absolutely. Things have got hugely easier. I mean, there is a huge amount of the mountain still to climb, but we have climbed a hell of a lot of it. Just the nature of a conversation, the kinds of people who want to hear about this. The way in which credentialed scientists with reputations that they need to protect are willing to embrace this. We could not conceivably have created the scientific advisory board that we have now fifteen or even ten years ago. There are thirty people there who are all world-leading luminaries in their fields, and they are all signed up very explicitly to the ideas that comprehensive damage repair is a thing and that it actually has a good chance of genuinely defeating aging. So, I’ve won the scientific argument. People are even reinventing the whole idea of comprehensive damage repair and pretending it’s a new idea. Five years ago, there was a paper called “The Hallmarks of Aging” published by five very senior professors in Europe. That paper is saying pretty much exactly what I said eleven years before it. The key difference is that unlike my work, this work is being noticed. In fact, it’s been more than noticed. It’s become the definition of what’s useful work to do. This one paper that was only published 5 years ago has been cited more than 2,000 times already. There’s no question that it’s going to be, by far, the most highly cited paper in the whole of the biology of aging this decade, and it has the same ideas that I put forward the previous decade. So that’s fantastic. I’d like to have more credit, but I really don’t care about that; what I care about is that the idea is now in the mainstream. Yuri: You mentioned your plan for comprehensive damage repair; could you elaborate a little bit more on what the plan actually is? Aubrey de Grey: Sure. The idea is to emulate what a mechanic would do to maintain a car. We know that this works; there are cars over a hundred years old that are still running and are doing so just as well as when they were built. We know that they are not doing that because they were designed to last that long; they were probably designed to last only ten years. They’ve vastly exceeded their warranty period, and they’ve done so because of comprehensive damage repair. The only reason that we can’t do this to the human body already is that the human body has more complexity and more types of damage. However, it’s a manageable amount of complexity. In particular, the big thing that led me through to this route was when I realized back in the year 2000 that we could classify all of the types of damage that the body accumulates into seven major categories, for each of which there’s a generic approach to fixing it. For example, one of the categories is cell loss, which is when cells are dying and not being automatically replaced by the division of other cells. The repair, of course, is stem cell therapy. We simply put cells into the body that have been pre-programmed into a state where they know what to do to divide and transform themselves into replacements for the cells that the body is not replacing on its own. That’s just one of the seven types of damage that I enumerated, and, of course, that direction is very well advanced. We have hardly ever done any work in stem cells because we didn’t need to; other people are doing all of the work that’s necessary. The other six categories are more neglected; they are in an earlier stage. That’s why we created the SENS Foundation to push them forward. We’ve been very successful. A number of those things have reached a point where we could actually create a startup company and transfer technology into it, so it would attract investment from the kinds of people I was mentioning earlier who don’t like to give money away. Yuri: So you’ve created several startups, could you elaborate on the ones that have the most potential? Aubrey de Grey: They’re all doing pretty well. Let me just focus on one as an illustration: Ichor Therapeutics. Ichor is all about macular degeneration, which is, of course, the number one cause of blindness in the elderly. The category in SENS that it comes under is the accumulation of molecular waste products inside cells. They accumulate in different cells in many different ways. It’s a side effect of their normal operation. Different cells accumulate different types of waste products. One of them is a byproduct of vitamin A that is created in the eye as a side effect of the chemistry of vision, and it poisons cells at the back of the eye called retinal pigmented epithelial cells. What we’ve done is identify enzymes in bacteria that are able to break down this toxic waste product. If they can break it down, the waste product no longer accumulates. We have identified the genes for these enzymes, and we’ve been able to incorporate them into human cells in such a way that they still work. Ichor is pursuing that, and it will probably soon start clinical trials to pursue this as a cure for macular degeneration later this year. This is dry macular degeneration, the major form in the elderly. Yuri: Could you tell us about some other startups that you’ve spun out from SENS? Aubrey de Grey: Sure. Ichor was part of LysoSENS. Another one that we’ve spun off is called AmyloSENS. We’ve got a problem of waste products that accumulate not inside the cells but in the spaces between the cells. In theory, those waste products are easier to get rid of, because they’re inherently easier to break down. The way we do it is by actually getting cells to swallow this stuff, internalize it, and then break it down. There are various ways to trick the immune system into doing that. In the case of Alzheimer’s, this was done some years ago, and it’s already working in clinical trials. Our focus has been on other types of waste products that are similar to the plaques in Alzheimer’s disease, but they consist of different proteins, and they occur in different tissues. We’ve been able to fund a group in Texas that was able to create some antibodies that could break down the extracellular garbage which is actually the number one killer for really old people, people over the age of 110. That’s now been turned into a company. Another example is a company that’s being run by the person who used to be our Chief Operating Officer. It’s a company focused on organ preservation. It’s well-known that there’s a huge shortage of organs for transplants. Many thousands of people die every year on waiting lists, just waiting for an organ that is sufficiently immunocompatible for them and that happens to be donated by somebody who dies really nearby. That is a requirement for that organ to be given to the recipient fast enough before it breaks down. We want to solve that transport problem and create whole banks of organs with a variety of immunological profiles. In order to do that, we need to be able to freeze them, but in order to freeze them, we need to develop ways that will not cause damage to the organ in the process of freezing. The company we spun out has got a wonderful new technology that is really good at that. Yuri: Is that Arigos? The company that uses helium persufflation for cryopreservation? Aubrey de Grey: That’s the one. You are very well-informed! Yuri: Can you comment on Human Regeneration Biotechnologies? Aubrey de Grey: That was our first spin-off, actually. It’s now got a shorter name. It’s called Human Bio, and it’s run and funded by a guy named Jason Hope, who was, for some time, one of our most major donors. He’s now focusing his funding on the company. It was initially created to do something very similar to what we’re doing with Ichor in macular degeneration. In that case, it was for atherosclerosis. The target was not this byproduct of vitamin A; instead, it was oxidized cholesterol, and they have kind of run into the sand a little bit on that. We’re trying to reactivate it right now, but they’ve got other interests as well. They’re working on senolytics, drugs that will kill senescent cells. They are potentially going to be quite a big player in a number of different areas at SENS. At the moment, they are a bit stealthy; they don’t need money, because they are funded by this wealthy guy. They are not going around telling everyone all that much about what they are doing, the way that most of these companies are. Yuri: What about enzymes that are meant to break glucosepane crosslinks? Is there a startup for that? Aubrey de Grey: We have funded research on glucosepane at Yale University. We’ve funded that for about 4-5 years now. They had a fantastic publication 2 years ago, where they made a huge breakthrough in this area. Essentially, they first had to be able to make glucosepane in large quantities without a high expense. That was published in Science; that’s our highest-profile publication in any area. It was important because it allowed them to proceed with obvious things, such as identifying enzymes that could break it. That was very successful: they have identified half a dozen enzymes that seem to be promising. For a couple of those enzymes, there’s a pretty good understanding of how they work. Now is the right time to create a company out of that, and that’s exactly what’s happening. That company is a month or two from being incorporated, and its funding is established. Yuri: Great, so we’ll be on the lookout for an announcement for that company to be spun off. Aubrey de Grey: It’s going to be called Revel. Yuri: Ah, let’s hope we can one day revel in its accomplishments. Aubrey de Grey: That’s right! Yuri: We might have gotten a bit too deep into science for a casual reader. Maybe we can step back and you could elaborate on what you think actually causes aging? I know there are different schools of thought on that in the scientific community so maybe you can share your perspective? Aubrey de Grey: I get rather sick of this question, actually. You know, there’s nothing that “causes” aging. What causes the aging of a car? You wouldn’t ask that question: you know that that’s a stupid question. All I really want to tell you is that the aging of a living organism is no different fundamentally than the aging of an inanimate machine like a car or an airplane. Therefore, questions like “What causes aging?” are no more sensible for a living organism than they are for a car. Yuri: If the underlying causes of aging are the same for all organisms, why do you think there’s such a big difference in lifespan between different species: some live for just a few months, while others for centuries? Aubrey de Grey: The analogy with inanimate machines like cars works perfectly well there too. Some cars are designed to last 50 years, like Land Rovers, for example, but most cars are only designed to last 10 years. It’s just the same for living organisms. Some living organisms have evolved to age more slowly. A perfectly good question is what causes evolution to create this disparity? Some species in a particular ecological niche, say, at the top of the food chain have an evolutionary imperative to age slowly, whereas species that get eaten a lot don’t need to have good anti-aging defenses built into them. That’s really the basis for why there is this variation in the rate of aging across the living world. Yuri: The more interesting question is when will humanity actually conquer aging? Aubrey de Grey: It all depends on how rapidly research goes, and that depends on money. Which is why when people ask me, “What can I do today to maximize my chances of living healthy and for a long time?” I tell them to write me a large check. It’s the only thing one can do right now. The situation right now is that everything we have today – no matter how many books are written about this or that diet or whatever – is that basically, we have nothing over and above just doing what your mother told you: in other words, not smoking, not getting seriously overweight, and having a balanced diet. If you adhere to the obvious stuff, you are doing pretty much everything that we can do today. The additional amount that you can get from just any kind of supplement regime, diet, or whatever is tiny. The thing to do is hasten the arrival of therapy for the betterment of what we have today. That’s where the check comes in. Yuri: Some people probably couldn’t afford to write a sizable check; maybe they can do something else? Aubrey de Grey: What I always say in relation to that is that the poorer you are, the more people you know who are richer than you. Therefore, the less you can do in terms of writing your own check, the more you can do in terms of persuading other people to write checks. Yuri: So it’s activism, being vocal about aging research? Aubrey de Grey: Absolutely. It’s activism and advocacy: it’s all about spreading the word and raising the level of people’s understanding of the fact that aging is the world’s biggest problem. Yuri: Do you see any increase in funding for longevity research over the past 10 years? Aubrey de Grey: Things have certainly improved. I mean, there’s more money coming into the foundation, a little bit more money, but there’s a lot more money coming into the private sector, into the companies I mentioned and other companies that have emerged in parallel with us. The overall funding for rejuvenation biotechnology has increased a lot in the past few years, and we need it to increase a lot more. The private sector can’t do everything, not yet, anyway. There will come a time when SENS Research Foundation will be able to declare victory and say, “Listen, everything that needs to be done is being done well enough in the private sector that we no longer need to exist.” For the moment, that’s not true. For the moment, there are still quite a few areas in SENS that are at the pre-investable stage where only philanthropy will allow them to progress to the point where they are investable. Yuri: It’s great to hear that there is money coming into SENS because from what I understand, there was a time when you had to use your own money to fund the foundation, is that correct? Aubrey de Grey: That’s right. I inherited 16.5 million dollars of which I donated 13 million. That was back in 2012 before we had any projects that we could spin out into companies. That inheritance was very timely, but the point is that I would still do it even now. If my mother died today, I’d probably do the same thing, because the foundation is still the engine room of the industry. For the foundation, it’s kind of double aid. The more progress we make, the more credible the whole idea becomes, which, of course, improves our ability to bring in money. We are also creating new opportunities where you can invest rather than donate, so it’s kind of a disincentive to donate. There’s a balance there. Of course, every donor is different; some donors are more philanthropically inclined than others. Yuri: From what I understand, you’ve had some high-profile donors like Peter Thiel who’s been supporting the foundation for a number of years. Is he still a supporter? Aubrey de Grey: Peter started supporting us in 2006, 12 years ago. He’s actually pretty much phased out now. I understand that. Ultimately, he’s much more comfortable with investing than donating. He wanted to be sure that we’re actually creating something, and sure enough, we are. We speak all the time to his investment advisors, who focus on investment opportunities in the biotech sector, especially in the anti-aging sector. I’m sure that he will continue to contribute financially to this field, though the contributions are quite likely to be focused more on the companies rather than the foundation. One way in which Peter is donating indirectly right now is that he funded Vitalik Buterin four years ago as a Thiel Fellow under the 20 Under 20 program. That was how and where Vitalik created Ethereum, which of course made Vitalik very wealthy, and Vitalik donated 2.5 million dollars to us a few months ago. He is very much philanthropically inclined. So, Peter is still donating to us by proxy. Yuri: What about his PayPal co-founder, Elon Musk? Has Peter ever connected you two or maybe you spoke to Elon yourself? Aubrey de Grey: I have indeed met Elon many years ago, probably 10 years ago. I haven’t met him recently. In general, I think it’s quite unlikely that Elon will get heavily involved in this just because he’s got other things to focus on. It’s a bit like Bill Gates, though in the opposite direction. Bill Gates has pretty much explicitly said that his priority is to help the disadvantaged. He’s much more interested in mosquito nets in sub-Saharan Africa and less interested in people who already have advantages. Elon is kind of at the other end of the spectrum. He is more of a “toys for boys” kind of guy. He’s more interested in space travel and solar energy and so on. The thing is I don’t want to take money away from either one of those two people. I think that both of them are doing fantastic work that really matters for humanity. There are plenty of other people, such as Peter Thiel, who are in the middle, who do understand the enormous value of defeating aging, and who have the vision to understand who is likely to be able to do it, so I don’t want to distract either Elon or Bill from what they’re already doing. Yuri: Do you think Elon might be moving in a somewhat different direction of mind uploading for circumventing aging? Aubrey de Grey: Yes and no. I kind of pay attention to what he is doing with Neuralink and what people like Bryan Johnson are doing with Kernel. I am closely connected with those groups. I know a lot of people in that space. At the end of the day, I think they know as well as I do that it’s very, very speculative. Ways in which we might transfer our consciousness, our personality to different hardware, while still satisfying ourselves that we are genuinely the same person after the transfer rather than just creating a new person – those are pretty speculative ideas. There is a long way to go to make them even slightly comparable to something that competes with medical research. Yuri: So you think that mind uploading, even if theoretically possible, is still far off in the future as something feasible? Aubrey de Grey: It’s always dangerous these days to say that such and such technology is definitely not going to be developed until some particular number of years in the future. At some point, people said that the game of Go would never fall to a computer, but then AlphaGo came along. However, it is a certainty that the distance that we have to go is much larger in the case of mind uploading than in the case of the boring “wet approach” of medical research. Yuri: Speaking of AlphaGo and AI, some researchers in the aging space are working AI as a kind of proxy to help us solve biology. What do you think about that approach? Aubrey de Grey: There is definitely an intersection there. I actually know a lot of people who are at the cutting edge of AI research. I actually know Demis Hassabis, the guy who runs DeepMind, from when he was an undergraduate at Cambridge several years after me. We’ve kept in touch and try to connect every so often. I think it’s reasonable to view these things as very linked. I certainly agree with you that there are some AI researchers who are working on AI precisely because they don’t trust people like me to get the job done by the “wet approach”. That’s fine; they may be right, and if they are right, I’ll be just as happy for them to save my life rather than me saving their lives. Yuri: Do you think we’re close to having AI help us with biology, or do you think it’s still years away? Aubrey de Grey: There are some medical AI startups that are looking at ways to use machine learning against aging. One of the most prominent is InSilico Medicine led by Alex Zhavoronkov, which is largely focused on identifying drugs that can work in particular ways. It’s a very important area. I’m sure that we will use AI a lot in medical research in general. Whether we will go as far as supplanting medical research with the mind uploading approach, that’s a different question altogether. Yuri: One of your most famous quotes is that you think that a person who will live for over 1,000 years has already been born. Do you still think so and what are the chances for, say, a 50-year-old person today to reach what you call Longevity Escape Velocity? Aubrey de Grey: I certainly think what I used to think, and it is indeed as a result of the concept of the longevity escape velocity. I do not believe that even within the next hundred years, we’re likely to develop therapies that can completely 100% succeed in repairing all the damage that body does to itself in the course of its normal operation. I do believe that we have a very good chance within the next 20-25 years of fixing most of that damage, and most are good enough because it buys time to fix a bit more and then a bit more. The reason it buys time because the body is set up to tolerate having a certain amount of damage without significantly declining function. I think we’ve got a very good chance of getting to that point while we are staying one step ahead of the problem by improving the comprehensiveness of the therapies faster than time is passing. Yuri: So that is essentially the definition of Longevity Escape Velocity, right? Aubrey de Grey: Yes, to be precise, Longevity Escape Velocity is the minimum rate at which we will need to improve the comprehensiveness of these therapies subsequent to the point where we get the first ones working so they get us a couple of decades of extra life. The good news is that longevity escape velocity goes down with time, because the more we can repair, the longer it takes for the stuff we can’t repair to become problematic. Yuri: If you had unlimited funding, how long do you think it would take for us to reach Longevity Escape Velocity or the technology necessary for it? Aubrey de Grey: It’s actually pretty difficult to answer that question because the amount of funding is kind of self-fulfilling. Every increment of progress that we achieve makes the whole idea more credible, makes more people more interested, and makes it easier to bring in the money to make the next step. I think that, at the moment, unlimited funding could probably let us increase our rate of progress by a factor of three, but that does not mean that we will change the time to get to Longevity Escape Velocity by a factor of three, because when we get even a little bit closer to it, it will be easier to get money, and that factor of three will come down. I think that right now, if we got like a billion dollars in the bank, then, in the next year, we would probably do the same amount of work and make the same amount of progress that we would otherwise make in the next three years. In the year after that, only two years of progress, and in the year after that, only a year and a half, and so on. What that adds up to is that if I got a billion dollars today, we would probably bring forward the defeat of aging by about 10 years. And it’s a lot of lives, maybe 400 million lives. Yuri: Yes, given that 100,000 people die per day from aging-related causes, it’s a lot of lives. Yuri: So, you said, “if I had a billion in the bank”. The Chan/Zuckerberg Initiative – they said they are prepared to spend 3 billion dollars to eradicate all diseases by 2099. Maybe they can set aside 1 billion for your work. Did you ever communicate with them? Aubrey de Grey: All I can say is that my email address is not very difficult to find online. No, we have not been in talks, and they have not made it easy for us to get in touch with them. Yuri: That’s disappointing, especially given your close geographic proximity and the fact that you probably have an overlapping social and professional network. Aubrey de Grey: Yes, it is very disappointing. Of course, you can argue that it’s not quite as disappointing as the situation with Calico. Because in the case of Calico we are talking about people with equally deep pockets who have known me for 15 years and who have already decided that aging itself is a thing to target. Zuckerberg, first of all, he never met me, God knows how much he knows about what we even do. Certainly, none of the pronouncements from the Chan/Zuckerberg Initiative indicate that they even understand that aging is a medical problem. They may have a long way to get to the point of even considering this. Yuri: Yes, they do use some odd phrasing, speaking about “eradicating all diseases”, considering that all age-related diseases have one root cause – the aging process. Aubrey de Grey: This is part of the problem. People simply should not be using the word “disease” for age-related diseases. The fact is that if a medical condition is age-related, then it’s part of aging, as it mainly affects people who have been born a long time ago. That means that it shouldn’t be described using the terminology that makes people think that it’s a bit like infection. People will often tell each other that I say that aging is a disease or a collection of diseases. But that’s completely wrong: I say the exact opposite. I say that not only should the word “disease” not be broadened to include aging, it should be narrowed to exclude the so-called diseases of old age. Aubrey de Grey: Yes, and atherosclerosis, everything that’s bad for people who have been born a long time ago but that very rarely, if ever, affects people in young adulthood. Yuri: So would you call Alzheimer’s a pathology then? If it’s not a disease? Aubrey de Grey: I would call it part of aging. The problem is the idea of carving up little bits of aging, pretending that they are separate from each other. They’re not; they’re all parts of – consequences of – a lifelong accumulation of damage. Yuri: Interesting. There’s been quite a large ongoing effort among the aging research advocacy community to persuade WHO to include aging as a disease in its International Classification of Diseases. Aubrey de Grey: Yes, it seems to be going quite well, and I am very pleased to see that this effort is being led by some Russians: Daria Khaltourina, who is very much Russian, and by Ilia Stambler, who is from Israel but of Russian extraction. Again, the Russians seem to “get it” much easier than most people and it’s very heartening to me. Yuri: Do you support this inclusion of aging into ICD as a separate disease? Aubrey de Grey: The ICD is a little bit different. The “D” in the ICD stands for disease, but the purpose of the ICD is to determine which things medicine should be attacking. It really should be the IC of “medical conditions”. We should be distinguishing medical conditions that are extrinsic, such as infections, from the ones that are intrinsic consequences of being alive, that are age-related. I believe that it would be better if we did that by using different words, but medical conditions of old age are medical conditions, and they ought to be listed in the ICD. Yuri: I see. Thanks for clarifying! Can I ask you about your new role with Michael West at AgeX and BioTime? Aubrey de Grey: Michael West and I have been friends for 20 years, and, of course, we have very closely aligned goals in life. We’ve never been able to work together in a formal capacity until now, but we’ve been very much mutual admirers. I’ve always looked up to Mike as someone who, way before anyone else, did something that I thought was impossible with the creation of an actual gerontology research company, as was the case with Geron 20 years ago. He’s done it three times by now: Geron, then Advanced Cell Technology, and now with BioTime. AgeX is a new subsidiary of BioTime that is about to be floated independently on the stock market. The goal, of course, is very much our goal: damage repair. The area that AgeX is focusing on is stem cells. There are two main themes within AgeX. One of them is stem cell therapy in the normal sense: in other words, injecting stem cells. The particular differentiator that AgeX and BioTime have is the ability to create particularly pure populations of a particular type of stem cells, ones that will only do what you want them to do – they are lineage committed in a particular way. That’s something that other organizations don’t have the ability to do nearly so well, and it’s very important; you want to be able to give the people the type of stem cells they need and not give them the other ones in the wrong place, which might do damage. That’s one side. The other side of AgeX, which is at a much earlier stage of development, so you shouldn’t be looking out for any products on the basis of this yet, is induced stemness. In other words, it’s giving an organism not stem cells per se but rather reagents that would cause cells already in the body to revert a little bit, become more stem-like and be more able to regenerate the tissues. We already have one compound that has this effect, but we have lots and lots more work to do that will allow this to be done safely and effectively. Yuri: Is this based on Michael West’s work in planarians, axolotls and other animals that demonstrate the ability to regenerate lost limbs even in adulthood? Aubrey de Grey: No, not really. Certainly, we pay attention to the regenerative capacity of lower organisms, but the main focus of AgeX’s work is on what happens in early development in mammals, particularly the phase change that happens during early development, which we call the embryonic-fetal transition. It’s a little bit imprecise; we are still characterizing it, and there’s still work to do and stuff to be understood. Basically, what happens is that over a relatively short period of time during development, there is a change in the level of expression in a number of genes; some of them go up, and some go down. The particular change that happens across the entire embryo seems to coincide with – and we think it’s causally related with – the loss of regenerative capacity. In other words, before this transition, a particular type of injury to the embryo is entirely reversed by regeneration, whereas after this transaction, the same type of injury is not reversed, it’s rather patched up with scarring. That’s what happens in the adult as well. We believe that this is very indicative of something that’s going on across the whole body and that has a close relationship with the decline in regenerative capacity and repair capacity against various problems within aging. Yuri: Is that the COX7A1 gene that was described in a paper in conjunction with Alex Zhavoronkov? Aubrey de Grey: Yes, COX7A1 is one of the genes that change expression during the embryonic-fetal transition. We do not yet know, or at least we’re not sure, whether it plays a causal role or whether it’s just a marker. We are definitely looking quite a lot at other genes that also change, but COX7A1 is the one we focused on first and most at this point, basically just because it has the sharpest transition in the cell types that we studied so far. Yuri: Would gene therapy be the vehicle to deliver to the body a way to modulate that gene? Aubrey de Grey: It might be. Exactly what you do depends on which cell types you decide matter the most in expressing or not expressing a gene and in terms of what gene you want to express. Yes, we might do it with gene therapy. Of course, there are different types of gene therapy. For example, if you want to knock a gene down, you can do RNA interference, which is something that doesn’t involve integrating a new gene into the cell’s DNA. If you want to knock a gene up, you can sometimes also do it by RNA interference, because you can sometimes find the genes that antagonize the gene you want to knock up. If you knock down the gene that antagonizes the gene you want to knock up, then it happens indirectly. There are lots of tricks that are specific to the details of the genetic network, but in general, we would want to manipulate the level of expression and effectiveness of certain genes that change during the embryonic-fetal transition. Yuri: Can I ask you about a different potential gene therapy, for example, partial reprogramming using Yamanaka factors? Do you think it has any potential as a systemic anti-aging therapy? Aubrey de Grey: This is the idea that’s actually very similar to what I just described when I talked about the idea of restoration of stemness that we are pursuing at AgeX. Mostly, we don’t know which way is going to work better. We believe that we have a priority in terms of intellectual property, which, of course, is important for investors, but that’s not my problem; I’m focusing on the science. Obviously, we don’t know which way is going to work best. There are lots of possibilities. The guys who pioneered the idea of partial reprogramming in vivo – there’s a group in Spain led by Manuel Serrano, who is someone I know very well; he’s spoken at one or two of our conferences in Cambridge. He’s a great guy doing a number of other really useful things; he’s got a brilliant new innovation in terms of killing senescent cells as well, which is a completely different area of SENS, of course. More recently, someone in San Diego named Juan Carlos Izpisua Belmonte developed a similar technique that he was able to make work, and his technique involved the intermittent inducible expression of the Yamanaka factors. Essentially, what will determine which of these approaches is the best is not just how well it works but how much harm it does, because there is always a possibility with these things that you will cause cells to become more regenerative that you wished were less regenerative, such as cancer cells, and we need to find a way to control that. It’s possible that AgeX will be able to do this better by using different genes. Yuri: Okay, great. The reason I knew about Arigos earlier is that I am a big proponent of cryonics. I wanted to ask about your views on cryonics and whether you would personally consider it for yourself? Aubrey de Grey: Cryonics in general – my position is well known. I’ve been a member of Alcor and a member of its scientific advisory board for 16 years now. I am definitely a very strong supporter. I think that it’s an absolute tragedy that cryonics is still such a backwater publicly and that a large majority of people still believe that it has no chance of ever working. Complete nonsense! If people understood it better, there would be more research done to develop better cryopreservation technologies, and more people would have a chance at life. The question is what can we do to make cryonics work really well? I certainly don’t have a strong philosophical position with regard to what kinds of revival constitute actual revival and what kinds constitute creating a totally new person from information that you got from the old person. I am not a philosopher, so don’t ask me about that. My personal inclination is that if I have to be cryopreserved at all, and I hope not to be just like any cryonicist, then I prefer to be woken up by being warmed up rather than by being rebuilt from some kind of information restored from slicing and scanning my original brain. Therefore, I am really interested in improving the cryopreservation process: in other words, reducing the amount of damage that is inflicted by the process of cryopreservation and therefore would need to be repaired for successful reanimation; of course, this is along with the damage that the body already had that led to it getting declared legally dead in the first place. Arigos, with its helium persufflation approach, is, in my mind, a massive breakthrough, a breakthrough even bigger than vitrification, which was made 20 or so years ago by Greg Fahy and his peers at 21st Century Medicine when they identified a rather elaborate cocktail of cryoprotectants called M22 that allows biological material of any size to be cryopreserved without any crystallization at all. It eliminated over 90% of the damage that cryopreservation would hitherto have done to biological tissues. After that, it had become the standard of care at Alcor, the Cryonics Institute, KrioRus, and elsewhere. We need more because the fact is that we still got a lot of cracking that happens – large-scale fracturing – and we’ve also got the toxicity of cryoprotectants, which is mild but non-trivial. Persufflation appears to solve both of these problems pretty much 100% by pumping helium through the vasculature, thereby stopping cracks from propagating, and cooling so much faster that you can vastly lower the concentration of cryoprotectants and still get no crystallization. Yuri: Did you work with Greg Fahy or Mike Darwin at all on this technology? Aubrey de Grey: I don’t work with any of these people, but I certainly talk to them. I am not sure what Mike Darwin has done, but Greg, as far as I know, had no work with persufflation itself. Obviously, he pioneered vitrification, but persufflation is something that was first explored in the Soviet Union, I don’t know exactly where, decades ago. Rather like parabiosis, it’s an area that was explored in the Soviet Union and then fell into neglect, and then everyone forgot about it for a long time, and then people in California found out about it and started to do something. The big innovation that Arigos has introduced was using helium, which has a number of advantages for cryonics purposes, but we are definitely building on what was originally done in the Soviet Union. Certainly, Greg Fahy has been involved in the conversation. He has been advising a lot, and my current understanding is that he is very optimistic about the promise of persufflation, which tells a lot about Greg. The fact is that if persufflation works as well as it’s probably going to work, it’s going to blow Greg’s last 20 years of work out of the water. It takes a lot of honor. Yuri: Absolutely; Greg is an amazing scientist and human being. I think for him, just as for you, it’s all about defeating aging first, and everything else is secondary. In any case, do you have any other cryonics research planned as part of SENS or Arigos? Aubrey de Grey: Not as part of SENS, but, of course, I talk to all these people all the time. Something that you might be aware of, which happened very recently, was that Alcor received a very large donation of 5 million dollars specifically for research from Brad Armstrong, one of the people who made plenty of money on cryptocurrencies. Yuri: It’s great to see crypto millionaires donating money to longevity research. Aubrey de Grey: Yes, 5 million dollars is a hell of a lot of money for research in cryonics compared to what’s been available up until now. I am actively helping Max More, CEO of Alcor, to decide how to spend it. Yuri: That’s great to hear. Maybe we’ll get some research done on the restoration of brain activity after cryopreservation. I know that Greg Fahy has done some prior work on assessing LTP preservation, but it’s probably outside of the scope of our interview. Switching topics, there’s a lot of talk about the biohacking community lately, and a lot of people call themselves biohackers these days. Some claim that taking supplements or working out qualifies as biohacking. Do you consider yourself a biohacker; do you take any supplements or nootropics like Ray Kurzweil or Dave Asprey or do anything else that could be considered as biohacking? Aubrey de Grey: I don’t take any supplements; I don’t do anything special with my lifestyle. I am not saying that that’s my recommendation for other people. My situation is very strongly that I am prepared to listen to my body. I know that I am just a lucky guy. I am genetically built so that my aging is slow, and I am fortunate enough to have been tested for a total of five times now over the past 15 years; they’ve measured 150 different things in my blood and did all manner of physiological and cognitive tests. I always come out really well, way younger than I actually am, so I should be conservative: if it ain’t broke, don’t fix it. I eat and drink what I like, and nothing happens. I will pay attention to the situation when it changes, but it’s not changing yet. There’s a couple of things that I do that are bad for my health, especially the fact that I travel so much that I am not getting enough sleep. I think I’ve been coping with that so far as well, and, of course, the reason I do this is to hasten the defeat of aging with all the work that I do. Maybe it’s a net win. The bottom line is that I’m lucky. I don’t say that Ray Kurzweil is being dumb in doing what he’s doing. On the contrary, Ray is one of the unlucky people; he came down with Type 2 diabetes in his 30s, and his family has had a lot of cardiovascular problems. It probably makes sense for him to be taking all of these supplements in order to largely normalize his rate of aging. For somebody whose rate is normal or better, there’s no evidence that taking supplements could actually have any benefit. Yuri: What about the cognitive enhancers that Dave Asprey is recommending? Have you ever found anything that works or that you have considered trying? Aubrey de Grey: No, I let my brain do what it normally does. Even for jet lag or needing to go to sleep, I don’t need these things. I can get to sleep whenever I am tired, whatever time of day it is. I occasionally thought it might be good to have a stash of modafinil just to be able to get through times when I need to stay awake for a long time, but I managed to work my way around those periods, so I haven’t done that either. Yuri: Maybe your brain is already overactive – I read that you do math problems for fun, and what was this preprint that you published that made a splash in the media? Aubrey de Grey: I’ve always played with maths for fun. I am reasonably good with certain types of maths, especially those that don’t need too much background knowledge because I don’t even have a degree in maths like graph theory or combinatorics. Yes, earlier this year, I got lucky and made some progress on a very famous long-standing maths problem called the Hadwiger-Nelson problem, and that got a bit of attention. The thing that strikes me the most about all that is that a number of people said, “I always thought Aubrey de Grey was a bit of a lunatic and never paid any attention to what he said about aging, but now that he made progress in this maths problem, he’s obviously smart, so now I will pay attention to what he says about aging.” I think that’s the most fucked-up logic you can possibly imagine, but I’ll take it. Yuri: From what I understand, despite your background in computer science and no formal training in biology, you actually also have a Ph.D. in biology for your work in mitochondrial respiration back in the 1990s. Is that correct? Aubrey de Grey: Yes, that’s correct. I benefited from the fact that I’d done my undergraduate degree fifteen years earlier in Cambridge. Of course, that was in computer science, but there’s a system at Cambridge where if you do your undergrad degree there, then you don’t have to be a Ph.D. student to get a Ph.D. from Cambridge. You can just submit published work, it gets evaluated like a dissertation, and you do a thesis defense. Mitochondrial respiration was probably the first area in biology that I got interested in and that I was invited to write a book about, so I did. It included the material for the first six papers of mine, and that’s what I ultimately got my Ph.D. for. Yuri: It seems that the mitochondrial theory of aging was all the rage back then but has lost a lot of its appeal over the past two decades. Aubrey de Grey: Yeah, that’s a problem. The reasons why things move in and out of fashion in a biological field are often overly superficial. Nothing’s really changed. Twenty years ago, people were overly breathless about mitochondria and free radicals, and they were neglecting the importance of the shortcomings of those theories, which my first couple of papers helped to repair. I pointed out that you can’t just say “mitochondrial mutations matter because free radicals matter.” You’ve got to flesh it out, and I did flesh it out in a way that nobody else had bothered to do. Conversely, what happened more recently is that people have swung the other way, saying “there’s various new evidence that free radicals don’t matter, therefore game over.” Again, they are being overly simplistic in the opposite direction. In fact, what this new evidence shows is that certain, particularly simplistic, versions of the free radical theory of aging are not true, but people like me who actually pay attention knew that all along. For me, nothing’s really changed. Yuri: You make an excellent point that there seems to be some kind of fashion in the field of biology in general or aging research in particular. I wonder why; is it just human nature to jump on the bandwagon and reject all other ideas, or is it groupthink? What is it about science? Aubrey de Grey: In science, I would say it’s even worse than groupthink. It’s not a question of people just being sheep because they can’t think for themselves. Scientists can think for themselves. The problem in science is that people are forced to follow fashion in order to get money, whether it’s in the form of a grant application, funding, getting promoted, or tenure, which is appalling, because the whole point of science is to go against the grain, to be in the minority of one as often as possible, and to find things out that people didn’t know before. However, the way that the scientific career structure these days actually works opposes that. It’s a tragedy. Yuri: Indeed, the incentives for going against the grain seem to be misaligned. Is there any way to mitigate this? Aubrey de Grey: The only solution is to throw a lot more money at science so that people can be career scientists in a way that they used to be 200 years ago when no scientists were without patrons, wealthy noblemen who kept them as pets. They were getting stuff done, and they didn’t have to worry about justifying how they were getting stuff done. Yuri: Well, let’s hope some philanthropically inclined wealthy noblemen hear you and create more fellowships. Okay, final, semi-serious question: once humanity does reach negligible senescence, what would that do to relationships, family institutions, marriage, and children? Aubrey de Grey: Nothing at all. The only things that would happen as a result of increased longevity are simply the continuation of societal changes that have already been occurring over the past century. What I see is that as people live longer and stay healthy longer, there’s a rapid increase in the number of divorces, the number of people who have multiple relationships over their lives, and it’s just going to be a continuation of that. It’s not interesting. Yuri: And overpopulation is never going to be an issue, right? Aubrey de Grey: This is the one that everybody is worried about, but it’s just so silly that people worry about it. I’ve been saying this since forever – and nobody contradicts my answer, they just ignore it – the answer is that the carrying capacity of the planet, the number of people it can sustain without a problematic amount of environmental impact, is going to go up much faster than the population can possibly go up even if we completely eliminated all death. It’s going to go up as a result of renewable energy, artificial meat, desalination, and all those things. It’s just so painfully obvious, and I’ve been saying this in so many interviews and so many talks, and people just ignore it. I think the only reason people are ignoring my answer is because they need to. They need to carry on believing that aging is a blessing in disguise and thus be able to put it out of their minds, get on with their miserably short lives, and not get emotionally invested in the rate of progress that we will make. Yuri: Well, let’s hope we can shake them out of their learned helplessness in the face of death and aging. Yuri: Great, thank you so much for this interview! I really look forward to seeing you in Moscow soon and discussing some of these issues in person as well as hearing about your latest achievements in the fight against humanity’s biggest problem! Aubrey de Grey: Indeed! Thanks so much, Yuri, it’s been great. Yuri Deigin is a serial entrepreneur and an expert in drug development and venture investments in biotechnology and pharmaceuticals. Yuri brings almost a decade of drug discovery and development experience from his previous role in a biotech startup where he oversaw research and development of original medicines aimed at treating diseases like Alzheimer’s and rheumatoid arthritis. Yuri has a track record of not only raising over $20 million for his previous ventures but also initiating and overseeing 4 clinical trials and several pre-clinical studies, including studies in transgenic mice. He also has experience in pharmaceutical product launch, promotion, manufacturing, and supply-chain management. Since 2013 Yuri also serves as a vice-president of the non-profit Foundation “Science for Life Extension” whose goal is the popularization of the fight against age-related diseases. To further this cause, Yuri frequently blogs, speaks, writes op-ed pieces, and participates in various TV and radio shows. Yuri holds a B.Sc. from the University of Toronto and an M.B.A. from Columbia Business School. Yuri is the CEO of biotech company Youthereum Genetics.